Lucy M. Stanak, ( nee Tatarek ), 94, passed away on Tuesday, September 11, 2018 in Punta Gorda, Florida with her daughter at her side. Born and raised in Jersey City, she graduated from Dickinson High School and lived in Jersey City until moving to North Arlington in 1966. 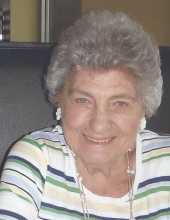 Lucy was an active member of the ladies auxiliary of the North Arlington Fire Dept. Eagle Truck Co. # 3, the ladies auxiliary of the V.F.W. Post # 4697 and a cafeteria worker at Queen of Peace Grammar School in North Arlington. She was the devoted daughter of the late John and Mary ( nee Polakowski ) Tatarek, the beloved wife of the late Edward V. Stanak Sr. , the adored mother of Edward V. Stanak Jr. and his wife Joelen , Cecilia Feuchack and her husband Jay, and Stephen Stanak and his wife Kathryn, the cherished grandmother of twin granddaughters , Emma and Lluvia , the doting great-grandmother of Ruby and Sam, the dear sister of the late Florence Daly and Peter Tatarek. Funeral from the Parow Funeral Home 185 Ridge Rd., North Arlington on Friday, September 21st at 9 a.m. thence to Our Lady Queen of Peace Church, North Arlington for the Funeral Mass at 10 a.m. Interment Holy Cross Cemetery, North Arlington. The family will receive friends on Thursday 4-8 p.m.
To send flowers or a remembrance gift to the family of Lucy M. Stanak, please visit our Tribute Store. "Email Address" would like to share the life celebration of Lucy M. Stanak. Click on the "link" to go to share a favorite memory or leave a condolence message for the family.